Happy New Year everyone!! I hope you are recovering from the holidays, ready for the new year…I know I am!! My kids love meatballs – and one of them has now decided that she loves tomato sauce. My younger one though, only likes the meatballs, and has me serve them alongside per pasta, that has been tossed in butter and salt. That’s how my older one started, so there is hope, but I was kind of in the mood to test it out a little. 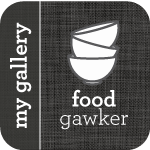 The sauce that usually goes with meatballs is very much a tomato sauce – so if you are not a huge fan of tomatoes, then that sauce is not something you would necessarily choose. 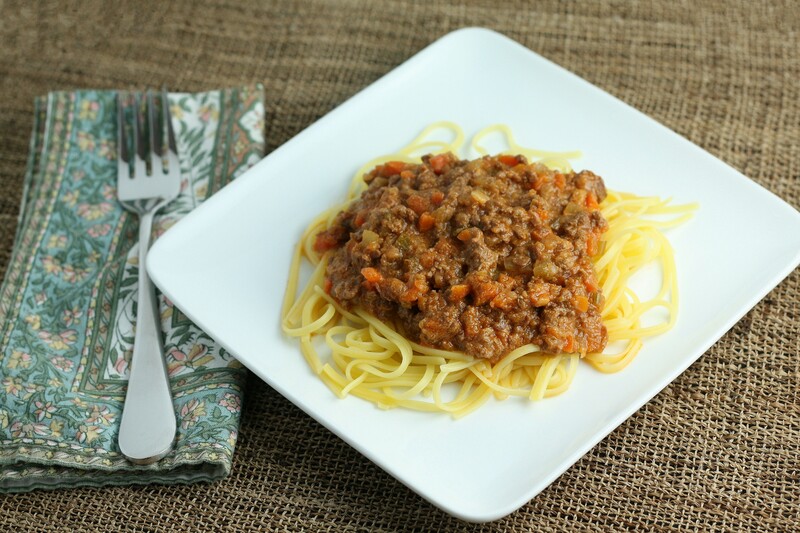 My girls love their meat though, so it was time to make a good meat sauce – a Bolognese sauce to be exact. One that simmers on the stove for hours and at the end, you can barely recognize there are any tomatoes to be found, just wonderful bits of rich tasting meat. I found this recipe in Cooking Light, and I decided to see if it would work. I used good quality meat, and did not rush the process. The house smelled incredible, and I knew it was going to taste amazing. I tried to mince the carrots and celery so fine that there was no way my kids could figure they were part of this masterpiece (at least my younger one anyway). Well, the experiment worked – they both loved the sauce – but my knife skills was not up to par…once my younger one figured out there were some vegetables in the sauce, she started only eating the meat – but still, she had a least a few bites that she loved before figuring out my secret. So, if your kids are not into tomato sauce, try this experiment for yourself. I would much rather have a big bowl of Bolognese as opposed to some meatballs in tomato sauce any day of the week – and now I know my kids would too. Heat oil in a large heavy pot over medium-high heat. Add onions, celery, and carrots. Sauté until soft, 8-10 minutes. Add beef, veal, and pancetta; sauté, breaking up with the back of a spoon, until browned, about 15 minutes. Add wine; boil 1 minute, stirring often and scraping up browned bits. Add 2 1/2 cups stock and tomato paste; stir to blend. Reduce heat to very low and gently simmer, stirring occasionally, until flavors meld, 1 1/2 hours. Season with salt and pepper. Bring milk to a simmer in a small saucepan; gradually add to sauce. Cover sauce with lid slightly ajar and simmer over low heat, stirring occasionally, until milk is absorbed, about 45 minutes, adding more stock by 1/4-cupfuls to thin if needed. DO AHEAD Ragù can be made 2 days ahead. Chill uncovered until cold, then cover and keep chilled. Rewarm before continuing. Bring a large pot of water to a boil. Season with salt; add pasta and cook, stirring occasionally, until 1 minute before al dente. Drain, reserving 1/2 cup pasta water. Transfer ragù to a large skillet over medium-high heat. Add pasta and toss to coat. Stir in some of the reserved pasta water by tablespoonfuls if sauce seems dry. Divide pasta among warm plates. Serve with Parmesan. Let me know how the experiment goes! Yum, I just made something similar to this for my son the other day. He’ll go either way with meatballs or in the sauce like this. I like that you added veal and pancetta, I’m going to try that next time. right after you saute the veggies, throw them in the blender or zap them with a hand blender. My husband even eats the veggies if they’re unrecognizable. But make sure you do it BEFORE you add the meat. Because blended meat is ick. Trust me on this one. Although I am trying to get my kids to eat the veges when they can actually see them…trying to get over the hump. But yes, I like that idea for very young kids!